Mexico raised both the Women’s and the Men’s Homeless World Cup trophies in Amsterdam on Saturday evening, making them just the second nation to secure a men’s and women’s title in the same year. With this win, the Mexican women are the first team to claim the top prize three times, overtaking the men’s teams from Italy, Scotland, and Brazil, who have each won twice. The top tier of the men’s competition was hotly contested this year. Ukraine – who fielded a mixed team – beat a strong Brazilian team 3-2 to advance to the final. A defensive power, Ukraine’s only loss was a penalty shootout to Zimbabwe. Mexico’s men made steady progress through the tournament as well, with their only loss going to South Africa in the first round. 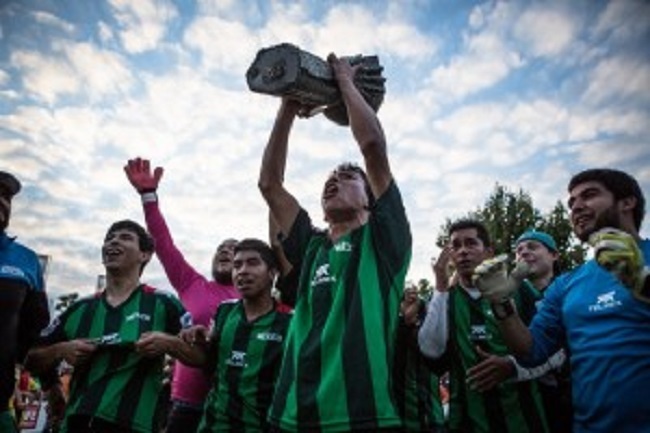 The 5-2 final win against Ukraine gave the Mexican men’s team its first ever Homeless World Cup victory. Mexico has been close to the trophy for three consecutive years – from 2011 to 2013. In 2012, they lost the cup to Chile in Mexico City, making this squad determined to finally bring the trophy home. The final match of the Women’s Homeless World Cup featured a familiar match-up: Mexico vs. Chile. The Mexicans secured a 3-1 victory. The two teams have faced each other in the final the last two years, with Chile claiming the trophy at home last year, and Mexico securing the top spot in Poznan in 2013. The teams were ranked Mexico #1, Chile #2 before the tournament. Both teams scored well over 100 goals this week, making them exciting teams to watch on the pitch. Mexico dominated throughout the competition, with commentator Tom Crosby predicting their championship victory early. This year marks Chile’s fourth and Mexico’s fifth appearance at the tournament. The Homeless World Cup is an annual football tournament that brings together teams from partner organizations from around the world in a celebration of their hard work and the personal transformations they enable. The event also brings the issues of homelessness and social exclusion onto a global stage, raising awareness and changing perceptions of homelessness. More than 500 players from 48 teams took part in the 2015 tournament in Amsterdam, each with his or her own unique story and hope for a better future. Ninety-four percent of past participants say that the event positively impacted their lives. The sense of pride that comes from being involved with the Homeless World Cup empowers homeless people to change their own lives.